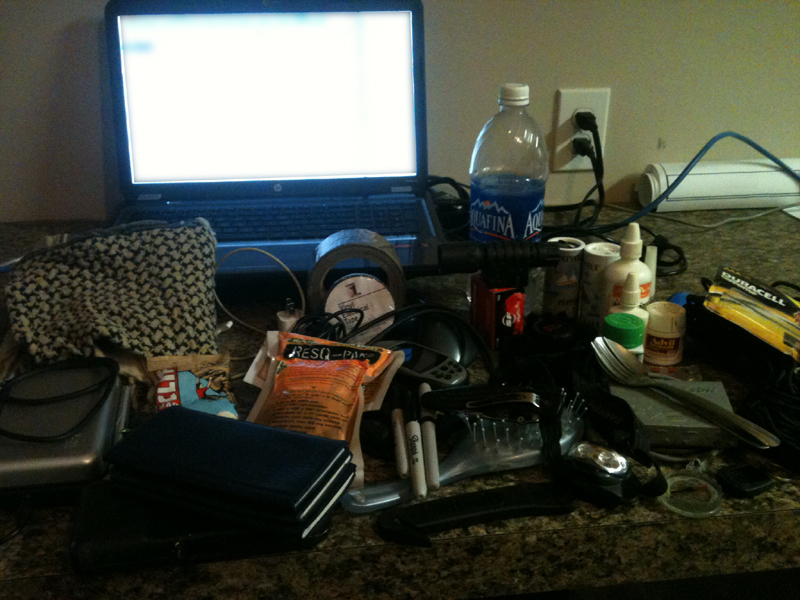 All of this stuff lives in a bag that is very nearly always with me or at least no further than in my vehicle. There was a lot more crap in that bag than I remembered. Perhaps it’s time to pare things down a bit and upgrade from EDC Bag 1.0 to EDC Bag 1.1 with a little bit lighter load. Say Uncle started it. And being a good lemming, I’m following. Everything you can see in this photo fits in the bag (including the laptop, charger, etc.) and, for the most part, has a dedicated purpose. There is often a pistol and a few extra magazines tucked away inside as well. Laying it all out like this, it’s a lot more stuff than I realized. I think I’ve fallen into the trap usually reserved for large purses in my attempt to cram tons of stuff in there. Going through it, there seemed to be a fair amount of junk that needed to be tossed, along with some redundant items. There are a few things I probably should add to it as well. What all is inside of Bag 1.0? Okay… but what’s in your Zombie Apocalypse bag? The Zombie Apocalypse bag is too big to carry around all the time. It lives either at home or in the Zombie Assault Truck (more on that later) where there is plenty of room. I think that it would be very interesting to hear your take on what to carry for “on-the-go” survival, should a serious crisis happen. Jut for fun, what is your ultimate survival bag, one you can haul around easily, for any potential “apocalypse” scenario? I’ll probably get into that soon since I’ve been traveling on the road for as much as 3-4 months at a time, with 2-3 weeks between trips into town for supplies, I’m pretty much driving an Apocalypse Survival Truck as it stands right now. Still sorting out some details, since I’ve only been on the road since May right now, but the Winter Survival Kit I mentioned in a previous post is already riding with me, along with a number of other kits and bags. Of course I still need a few upgrades before the Zombie Assault Truck is fully operational. But that will come pretty soon! I’m curious why you have a stove and fuel but no food or water? I would also pare down the writing instruments to only one pen and one sharpie. If you can’t get it done with those two, you really can’t write it down. My own bag has a lot less stuff in it, but I cart around two Nalgene bottles of water in it, so the weight is probably comparable. Seriously though, toting around the checkbooks probably isn’t a wise idea. The box cutter can go, I’ve got a folding knife in the bag as well as one that (usually) remains clipped in my pocket. The fork, spoon, salt, and pepper are indispensable though, in my line of work being out on the road quite often I find myself with a meal and nothing to flavor or eat it with. Padlock doesn’t take up too much room, and the key lives on my keychain for locking up stuff in the bed of the pickup. AAA batteries are necessary for the GPS and headlamp, both of which I use on a regular basis, along with the vinyl tape, for work purposes.